This is a hot deal! Groupon.com is offering an extra 25% off promo code! Take advantage of this offer while it lasts because Groupon rarely offers 25% off codes (their biggest discount code). Save an incredible extra 25% off local deals (Ie. 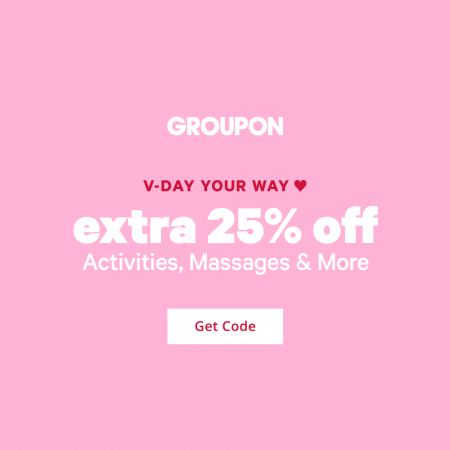 Dining, Spas, Massages, Activities, etc…) on Groupon when you enter the promo code VDAY at checkout. I’ve tested the code and can verify that it works. This promo code is valid for 2-days only and will expire on Saturday, February 9, 2019 at 11:59pm PDT. This is going to be a very popular offer so don’t miss out!